"After the Portuguese sailed for the Orient and returned from ancient China to Europe, they brought along with them new culinary techniques, including modifying the dough for Youzagwei also known as Youtiao in Northern China, for Portugal. However, they modified it by introducing a star design because they did not learn the Chinese skill of "pulling" the dough (the Chinese Emperor made it a crime with capital punishment to share knowledge with foreigners). 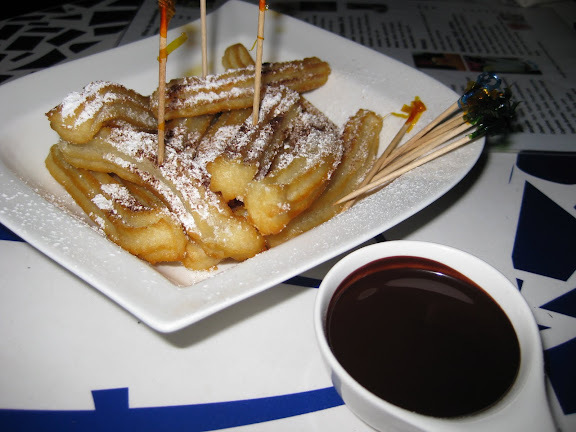 As a result, the churros is not "pulled" but pushed out through a star-shaped cutter." 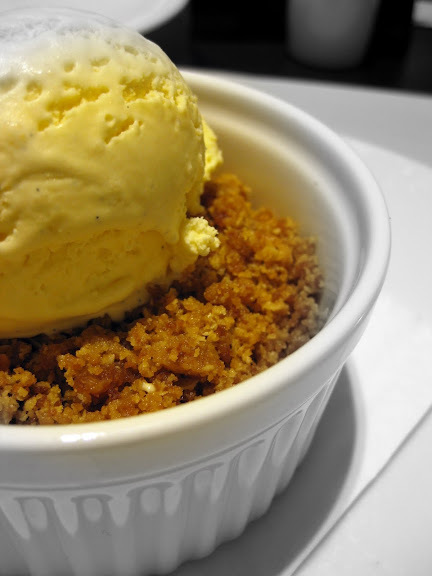 See, a food blog can give you a history lesson. Good. 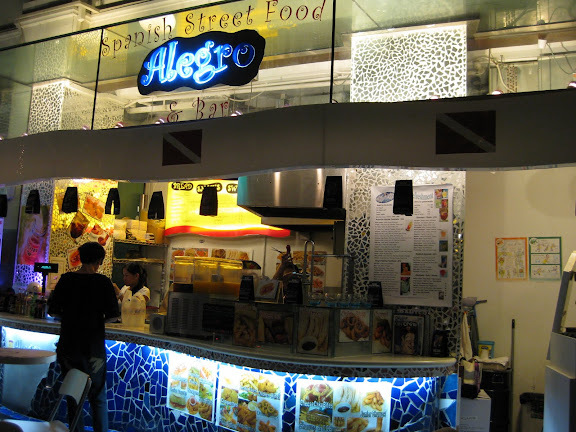 All Filipino-crew at this "Spanish Street Food" stall. Well, maybe it can be justified since Spain used to colonise the Philippines (cultural exchange!) but then, that was a veryyy long time ago. Or maybe it's just a coincidence! $7.70, incl. 10% service charge. I've always wanted to give Ricciotti a visit for its much reviewed desserts but haven't really found the time to do so until most recently. 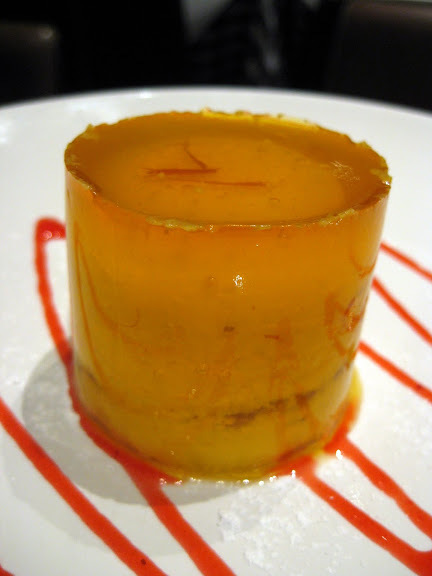 Some of the desserts were good, some were utterly... horrid. I'm not sure if it's because we can't appreciate them but it was pretty unanimous across a table of seven that we didn't like the ricciotti or the profiteroles at all. The good things first: the morbida. A curious name, certainly strikes up the word "morbid", but hey, this is good stuff. 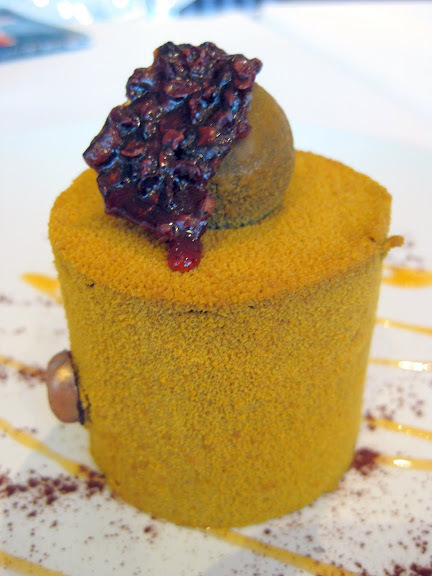 It tastes better than the way it's described - "mouth watering chocolate mousse on a base of supple chocolate sponge" - as it combines soft chocolate mousse with a solid core and well, delicious liquid chocolate inside. 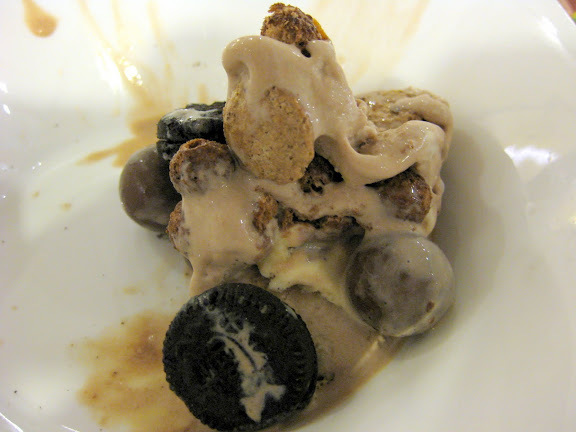 Pity the pictures are quite out of focus, but this is one dessert from Ricciotti that you should try! 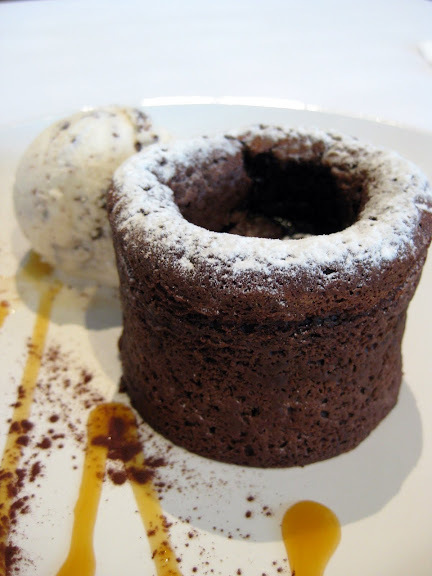 This warm, dark chocolate cake was a joy to behold (and to eat), much because of the richness of the cake and the oozing liquid chocolate inside. 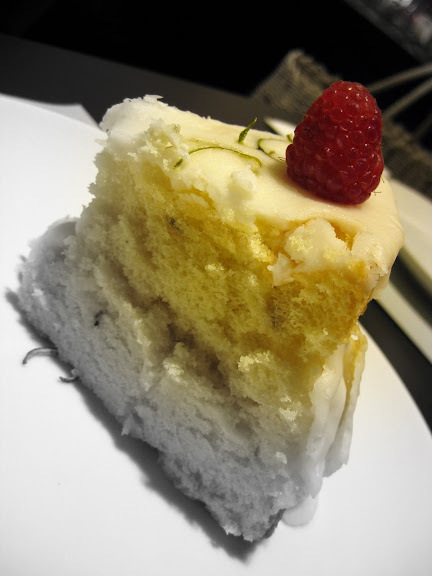 My friends were saying that this soffiato's pretty good because the cake is adequately moist as compared to some others which are quite dry. 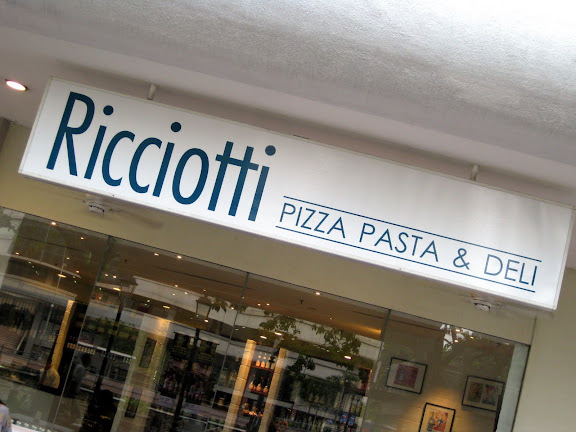 We thought the ricciotti, being from a restaurant named as such, would be good. It turned out to be as unimpressive (and boring) as it looks and no one bothered to finish it. A couple of my friends were a little too loud in sounding their displeasure and I think, from the dark looks of the waiters, that they've gotten their audience alright. Tsk. Tact, people, tact. 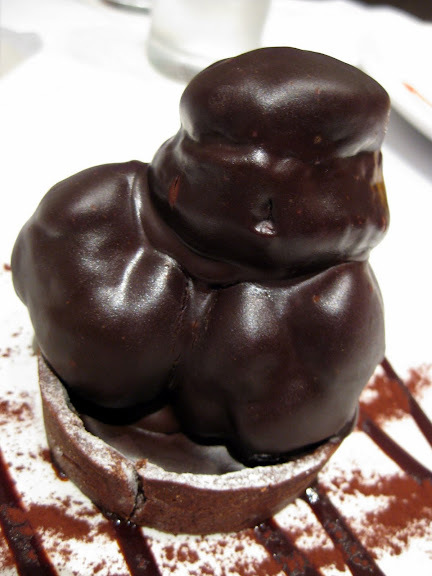 Ah, the profiteroles. When it came to the table, my friend shrieked and said we shouldn't have ordered it (she was too busy fussing over something else when we were making our orders). Later, I understood why she reacted that way. 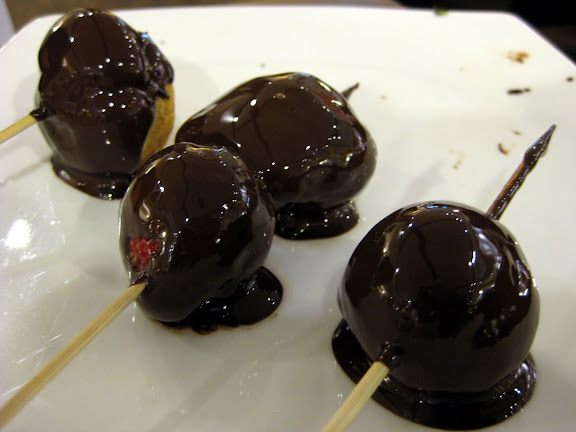 The profiteroles were made of three custard balls moulded together, one being vanilla custard, the other was chocolate custard, and the third, some bright greenish "sludge" that I couldn't quite identify. The chocolate custard was the most bearable of the lot, the greenish one on the other hand was the least edible, at least to us. I'd spare you the picture of the close-up because it turned out looking quite gross! The chocolate coating over the cream puffs wasn't very nice, and the exterior of the cream puffs was actually rubbery. 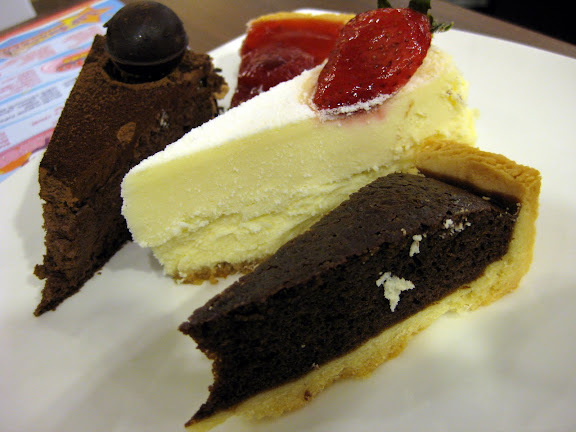 Very good, but we noticed a change in the waiters after my friends' outburts. The Riverwalk (Upper Circular Road / Boat Quay), # B1-49/50. 1. I heard that the main courses here are quite good, so you might like to give them a try. Click here for the menu. 2. Lots of daily promotions, including daily one-for-one beer. Click here for the list of promotions, and look up "seasonal promotions". 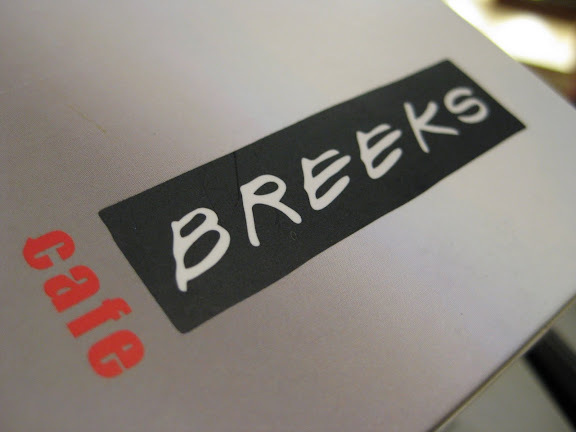 It has been a really, really long while since I've last visited Breeks Cafe, a Western-cuisine restaurant brought to you by the same people behind Seoul Garden. 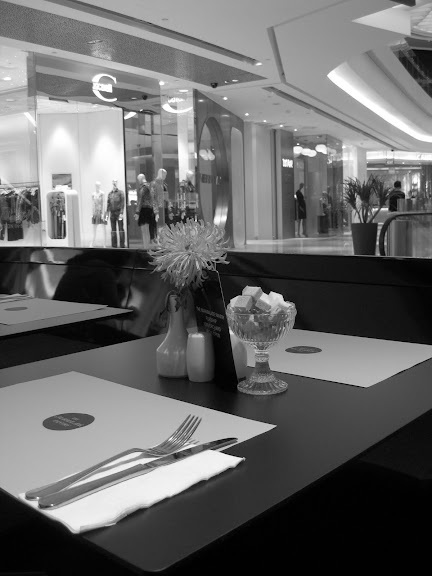 The menu certainly seems enticing, and if you're curious about what's on offer, click here for a look. 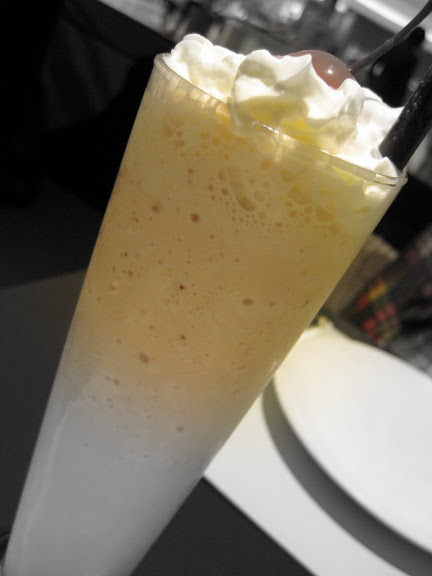 Me and my friend shared this over our glasses of iced tea (and for me, my ice-cream). It's pretty alright but somehow it has a cheesy-like smell over it. It's definitely fresher than those from Carl's Jr but somehow or another I still have a slight preference over the latter. Good. Refills our glasses of iced water regularly. 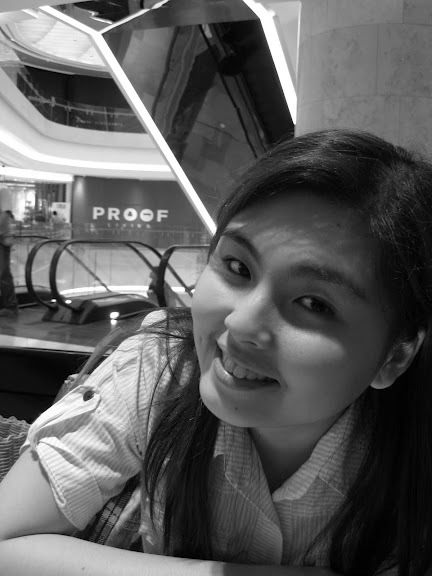 Orchard Ngee Ann City, #05-29. It looks like a page out of a fantasy book - an ice-cream buffet?! 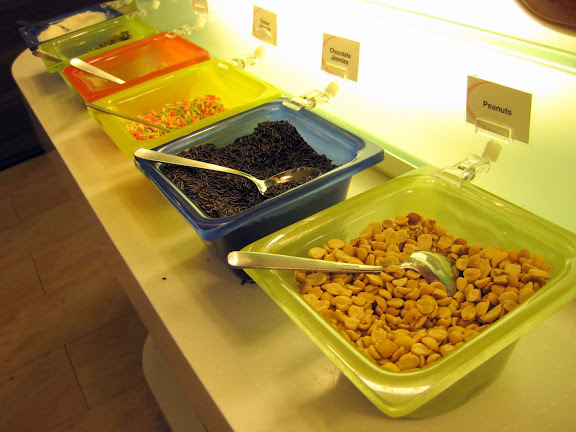 Sure, it does seem like every ice-cream lover's dream, but after today's experience I think first-timers would need some advice and tips on how to "survive" this buffet. 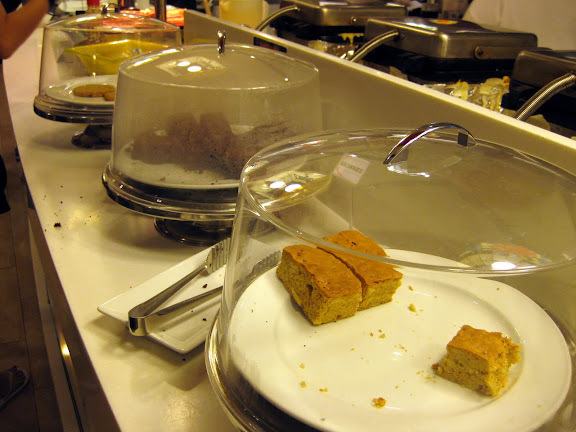 For those of you who somehow or another have not heard of this buffet and the two month-long one-for-one promotion, you've got six more days. For your ticket, go ahead and click here (1 redemption per emailer - so print more)! 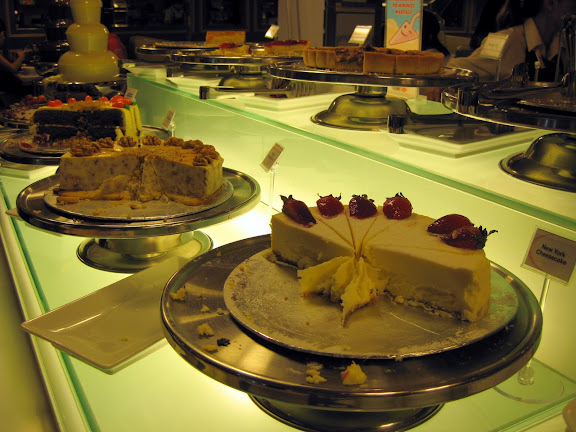 Tip #1: Go easy on the pastries and cakes. Or if you could, stay away from the cakes completely, because they aren't that nice anyway and they're just wasting space in that tummy of yours. The peanut butter chocolate tart looked promising but was too dry and bland, the cheesecake was too thick, the strawberry tart (according to Daphne) "tastes weird" and the chocolate truffle was the most... acceptable of the lot. The large cookie is fine but I would think the brownie would take up precious tummy room too. 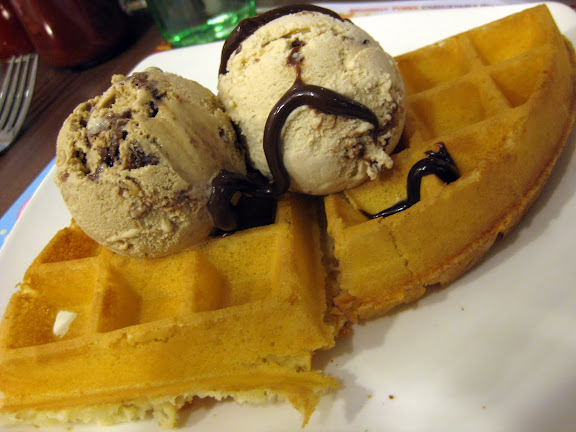 Tip #2: Enjoy the waffles with ice-cream. 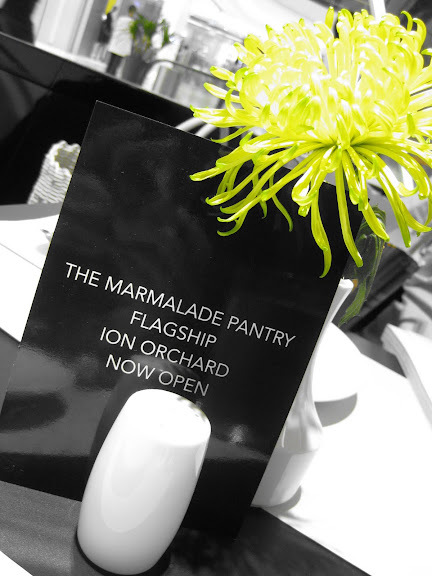 The freshly baked, hot and crisp waffles were simply a delight to have with the cold ice-cream! Daphne preferred to have butter and honey all over the waffles but hey it's an ice-cream buffet right! Two servings of waffles, as you can see in the picture above, was enough for me. Much more and I probably wouldn't have space for the other ice-cream flavours. And oh, I know the chocolate fudge looks pretty miserable, but that's because it was close to impossible to maneuver the plate around the chocolate fudge "taps" given the way that they're positioned. Tip #3: Start with the milky ones. 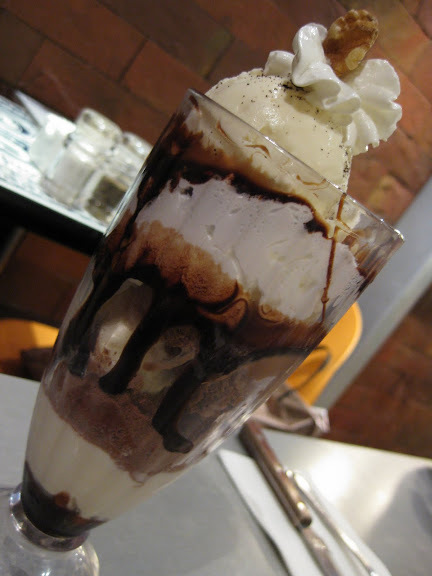 Start with the chocolatey and milky ice-creams first, leave the gelati (plural for gelato) for later (see Tip #9). 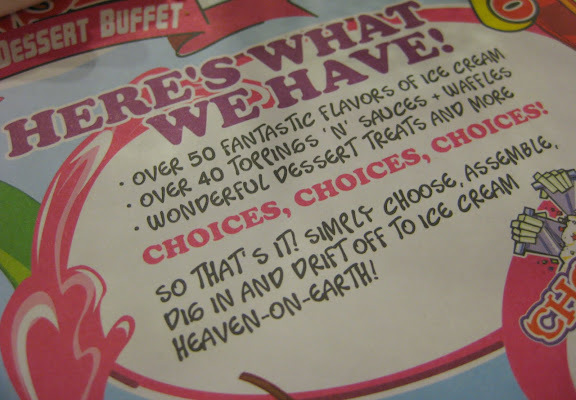 This way you can gauge your personal "capacity" for ice-cream haha. 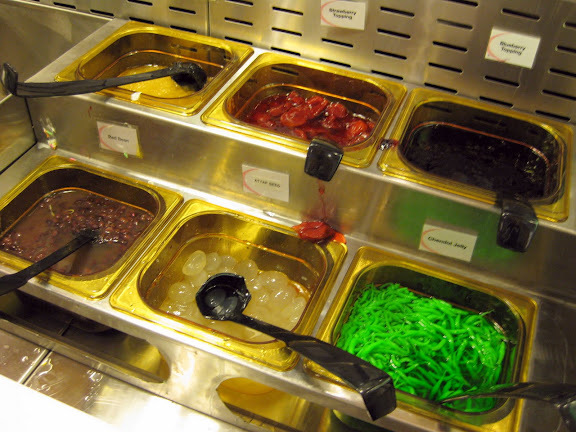 Tip #4: Use (many) toppings. 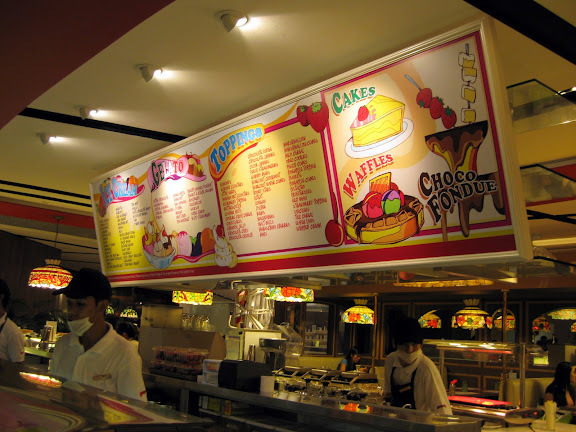 This way, the richness of the ice-creams would not threaten to overwhelm you. 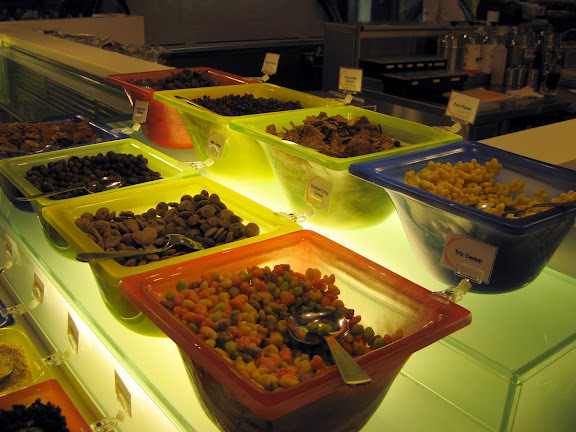 Having all sorts of toppings spread around keeps your mind/tummy "distracted" with all the multiple tastes. Tip #5: Don't bother with the "chop shop". 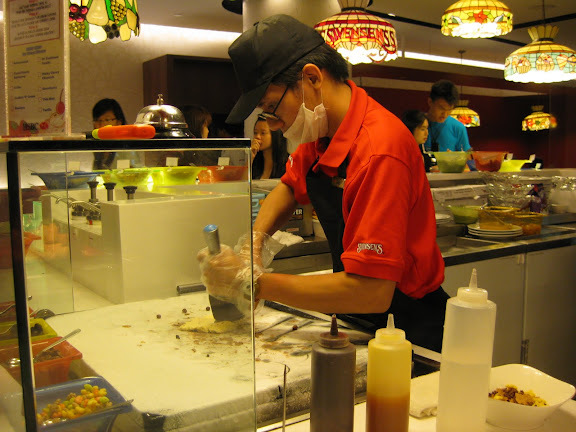 You thought it would be something like Cold Rock Ice-Creamery where the ice-cream "chefs" would chop up the toppings and mix it really well with the ice-cream. Not here. All the guy did was well, put the ingredients in the middle, then fold the ice-cream over them like a sandwich. Even I could do that at my table! Then again, cut the poor guy some slack, it's tiring doing the same thing over and over again with a long queue of customers. 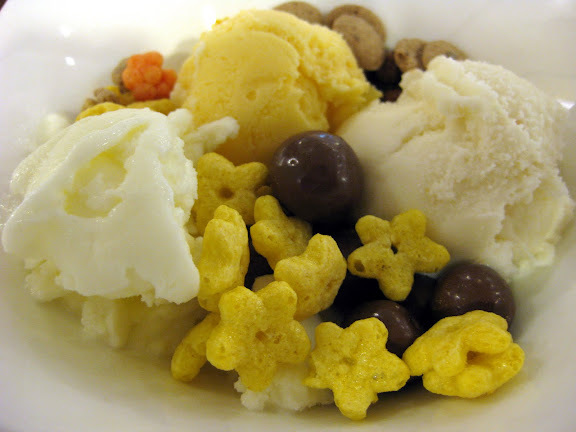 Yeap, ice kachang type of ingredients here like jellies and red beans. Do your mini chendol too if you like. Tip #7: Take a break. 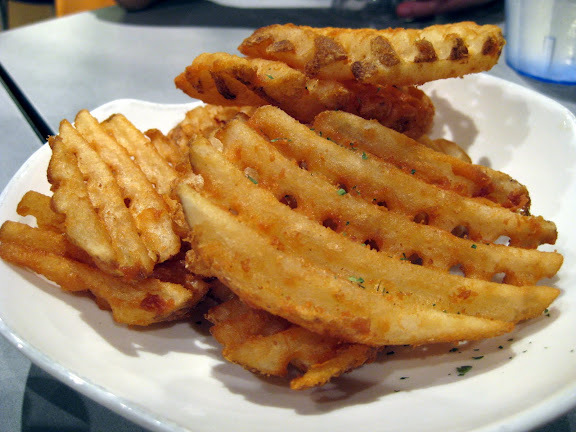 Have some french fries. You must be thinking: WHAT? 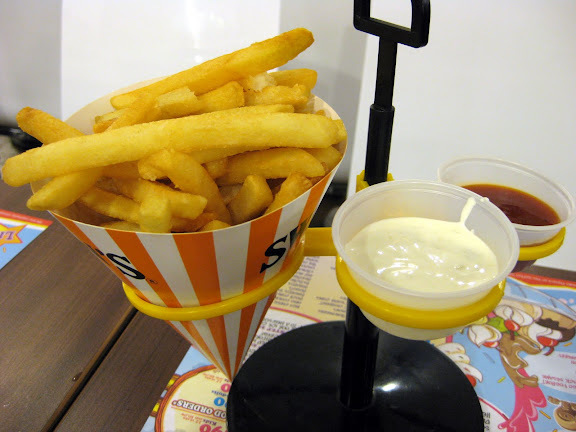 I thought so too but here's reasons why: 1) Swensen's fries are really quite good actually - hot and crispy, and 2) it's another "distraction" tactic to get your mind off from eating ice-cream after ice-cream after ice-cream. Stop all ice-cream eating midway, sit back, and eat some piping hot fries. 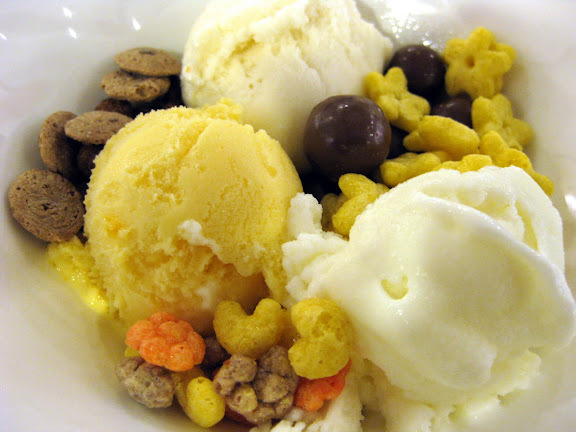 After a while, you'd be hungry for even more ice-cream! 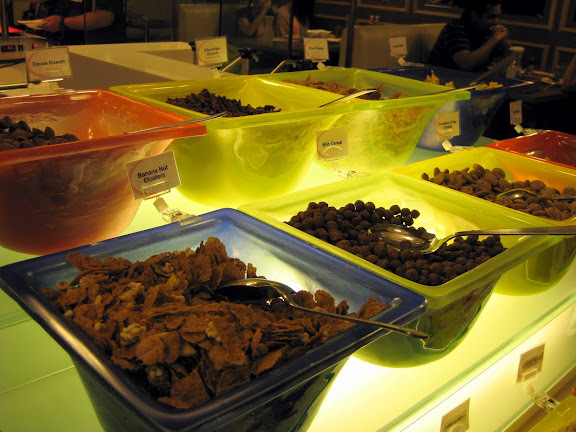 Credit must go to Daphne, in part because of her sudden craving for fries right in the middle of the buffet. 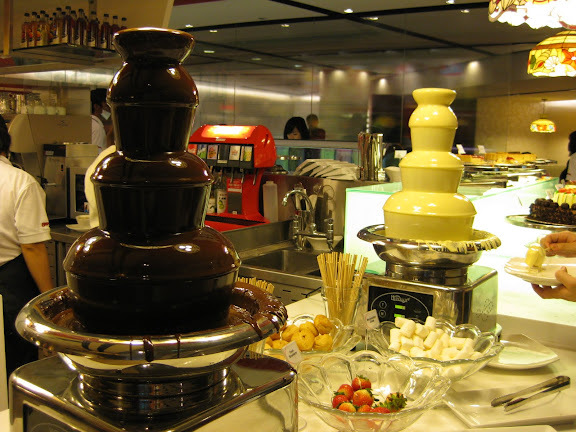 Tip #8: Don't forget the fondue. 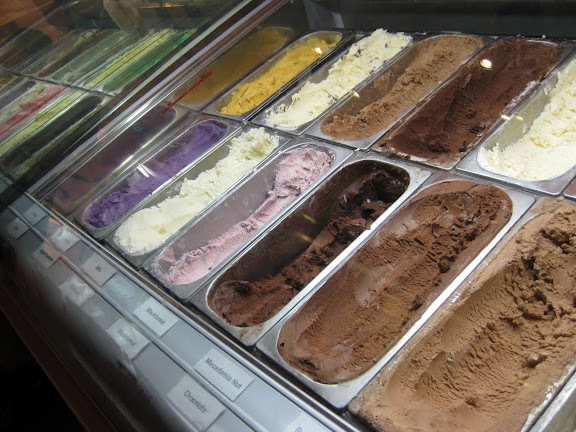 Tip #9: Start taking gelati when you're pass the "75% full" mark. They're lighter, especially the "fruitier" ones. 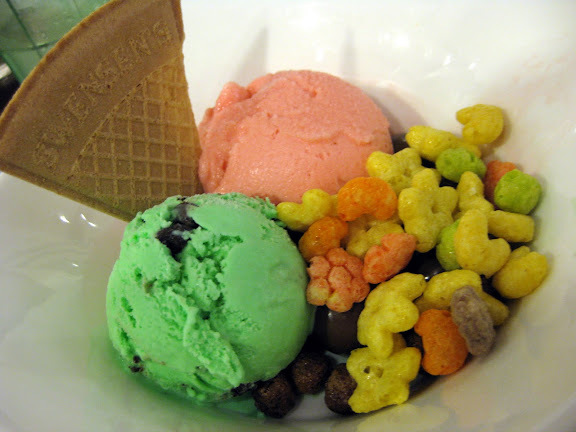 I especially liked the wild strawberries and peach mango gelati, really nice. The lychee one was okay, while the super lemon flavour (at least, I think that was the name) was quite an experience - extremely sour! But somehow I kept going for it haha! Tip #10: Most importantly, enjoy yourself. Excellent. Constant replenishing of iced water jugs too. I was thinking though if it was a tactic to get customers to keep drinking cups of water and then get too bloated for more ice-creams. $18.90++ for one, but given the promotion, it's for two then. And we'll watch the stars and glitter. Up these steps ever so slowly. Why are there so few of us? Perhaps only angels could afford heaven. "Will you come to tea?" I asked. "In the middle out of nowhere?" Yes here, with you. With me. You say that's why you are. Light, with too small a tinge of sweetness. I closed my eyes at the first spoonful. "I'm in love", I smiled. She retorted in between a smile. I smiled, then tucked back into heaven. A poetic slice of cake indeed. With thyme and lime, what a rhyme. I could tell, you like your cake. His first taste of cake. Subject to 7% GST and 10% service charge. 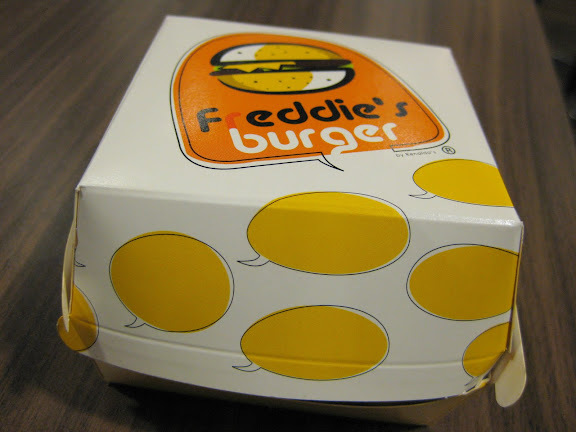 I was always tempted to try out the burgers at Freddie's ever since it opened at the Ion Orchard basement and it was not long before I managed to get Daphne to accompany me on yet another burger journey. The usual burger set, which comes with curly fries and a drink, would cost $8.50. But if you're a student, there's reason to be happy - $5.75 from 2pm to 6pm on weekdays! 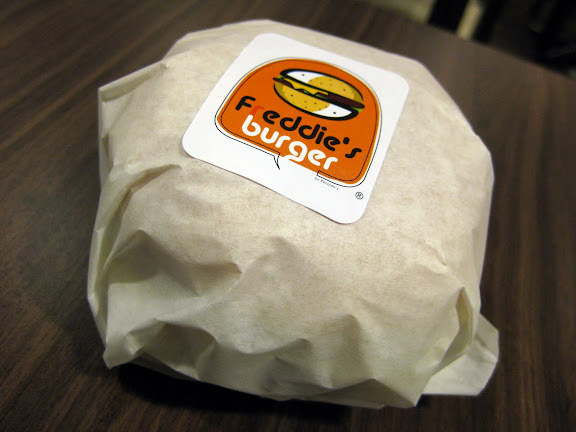 I have to admit that it's a little pricier than Burger King and almost as expensive as Carl's Jr, but the size of the burger is more or less on par with Burger King's and definitely smaller than those from Carl's. Which means it all comes down to taste. 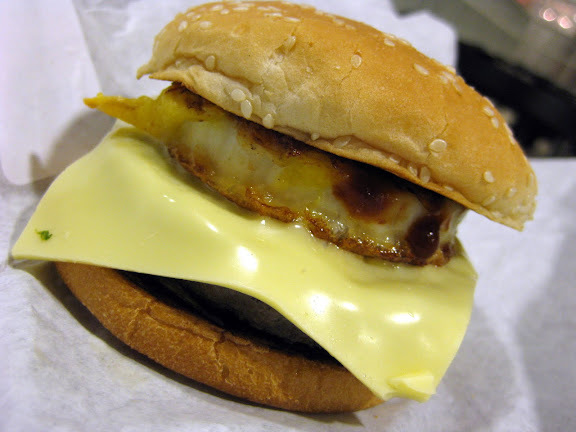 "The Aussie", a beef burger with cheese and fried egg, seemed like something so simple that you couldn't possibly go wrong with it. 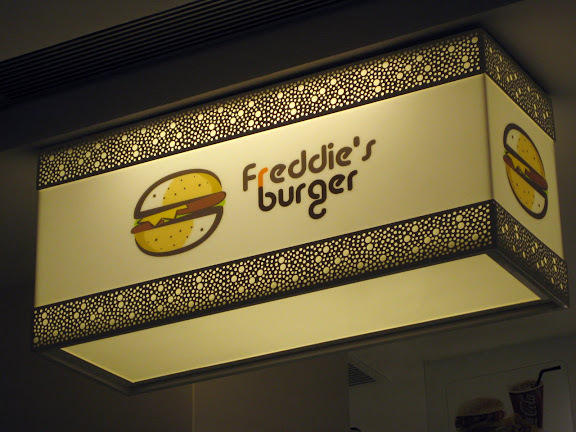 A good thing that Freddie's didn't disappoint. 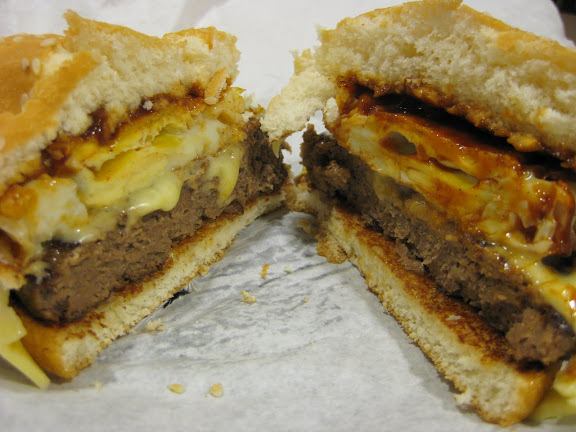 The beef patty was really tender and juicy, and it certainly went well with the sweet (barbecue) sauce. Simple but delicious. I'm biased. 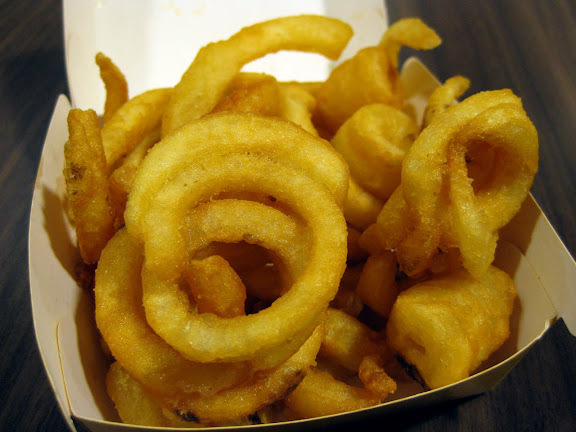 I love curly fries, I really do. The fries here, as you can tell from the picture, are of a brighter gold yellow colour than MacDonald's golden brown shade, which means the former is fresher and comes from well, less overused oil? Simply a delight to munch away with chilli sauce or if you like, on its own. $5.75 for a student's set meal (UP: $8.50). I've always thought Killiney Kopitiam was about coffee, kaya toast and half-boiled eggs. 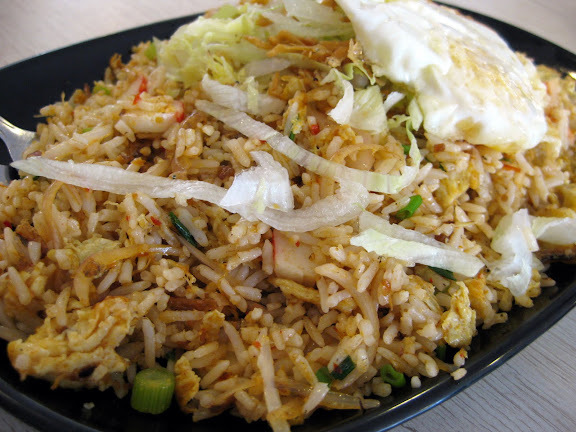 I never knew (until recently, of course) that its menu has expanded steadily to include things like penang fried kway teow, sambal fried rice, black pepper chicken and even fish porridge. 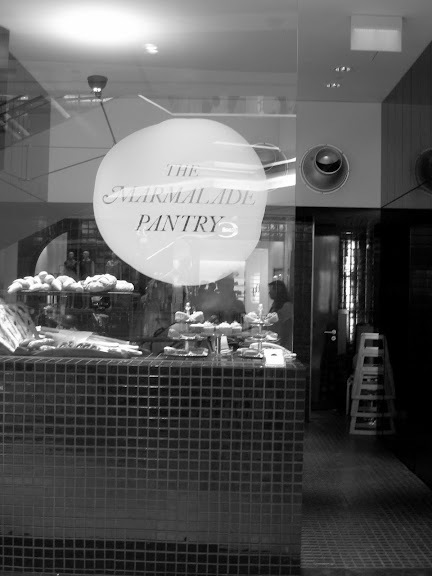 I doubt all of the Killiney outlets in Singapore have such an expanded menu, but if there's one place that I can be sure of that would be the new branch at Paradiz Centre. A very generous portion for the affordable price of $4.50. It usually costs $5 but this was on the "lunch special of the day" list and came with a free barley or grass jelly drink. It's tasty enough for my simple tastebuds, but I have to admit that halfway through the rice you would start feeling a little... bored. Still, decent and cheap enough. The fried noodles were not too bad (generous portion as well) and we noticed that this was almost on every table during the lunch hour. 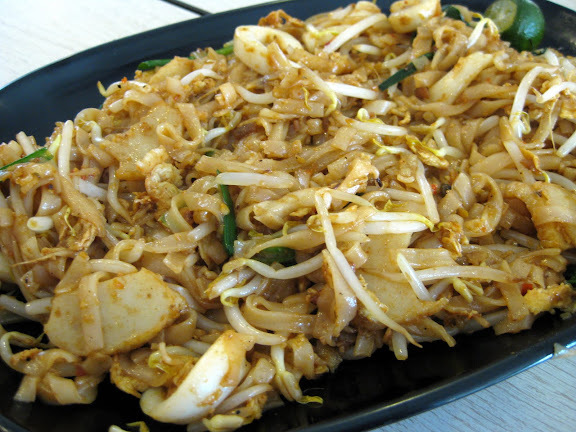 Good balance of noodles with ingredients like prawns, squids and fishcakes. Again, this is nothing impressive but we thought it's decent enough for a simple lunch. * Lunch specials vary from day-to-day. Paradiz Centre (Selegie Road), #01-03. 1. No pork, no lard menu. 2. First picture source here. 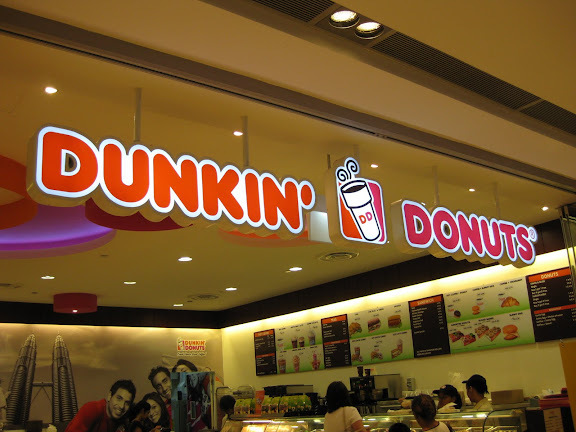 People born during my era (then again, I was only born in 1985) would remember the time when Dunkin' Donuts was around Singapore, and for those of you who are fans you would probably know that it has returned with its first outlet at Ion Orchard. 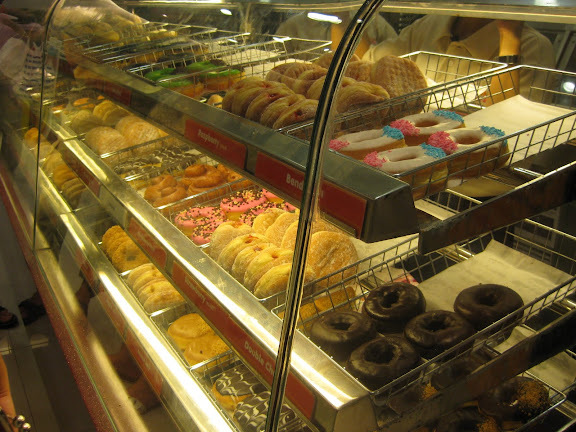 It will certainly be quite a while before Dunkin' Donuts joins the ranks of the big players - J.Co Donuts and Donut Factory - but if I remember correctly it's the only notable name that is Halal-certified, so good news for our Muslim friends out there. 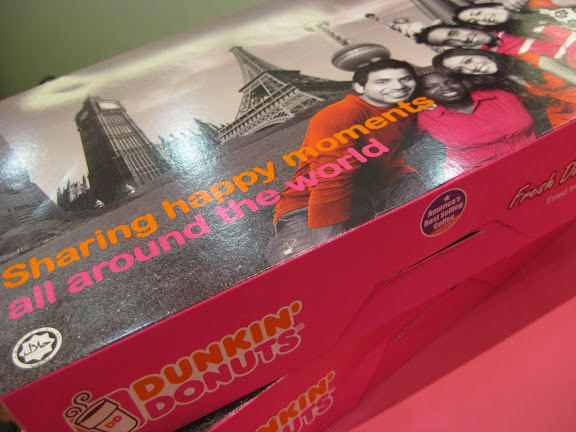 Truth be told, it's not easy trying to associate Dunkin' Donuts as being from the United States when it's boxes continue to bear the Halal-logo from Malaysia. Moreover, some of its names are clearly meant to suit the Malaysian locale, with donuts like "Bendera" (Malay translation for "flag") for instance which actually refers to the red, white and blue typical of the American flag. Then again, Malaysia could be claiming that these colours are also associated with its national flag. Who knows, Malaysia could go on claiming that donuts are quintessentially "Malaysian", like how it's trying to go about declaring that food like Laksa, Nasi Lemak, Chilli Crab and Hainanese Chicken Rice are all signature dishes from the country itself. 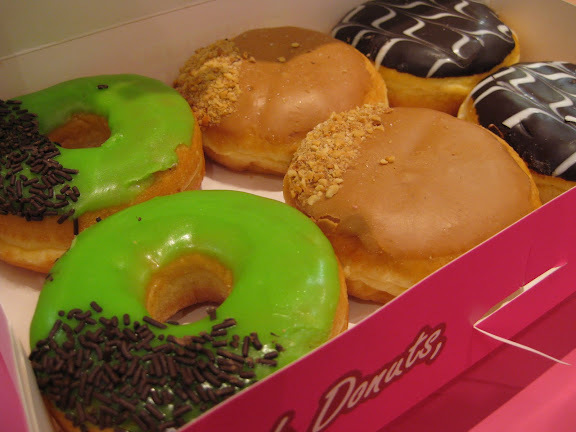 Of course, we'll leave that political debate alone for now, and bring our attention back to the lovely donuts. I like the Peanut Butter one the best, not only because it's peanut butter-glazed but because it has a sweet raspberry filling to it. Chomp down hard on the donut and the filling will spill out! 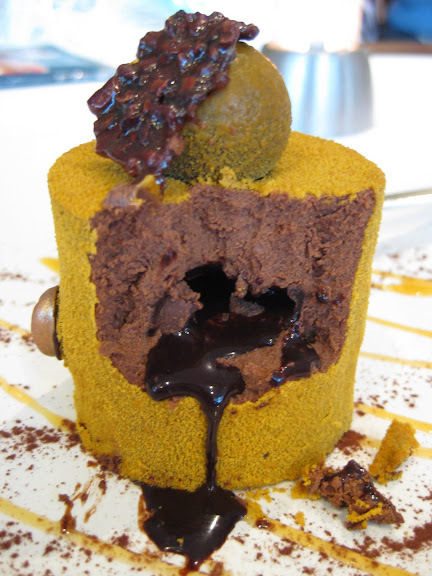 The Double Chocolate donut is not too bad as well, better for chocolate lovers because of its richness. 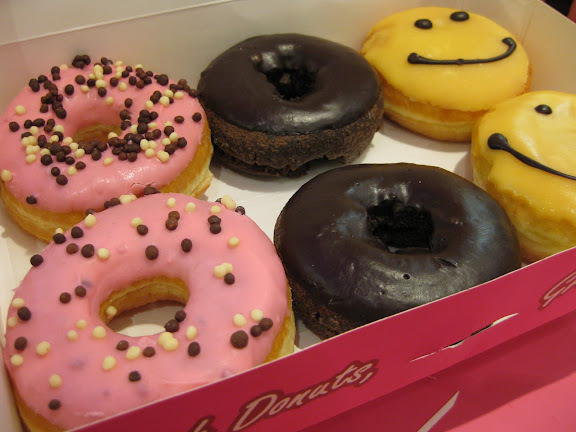 Many people like to grab the "Smiley" donut just because it's cute, and if you're curious it's of a lemon flavour. There's a current "Buy 9, Get 3 Free" promotion for $12.60, which translates to $1.05 for each donut.